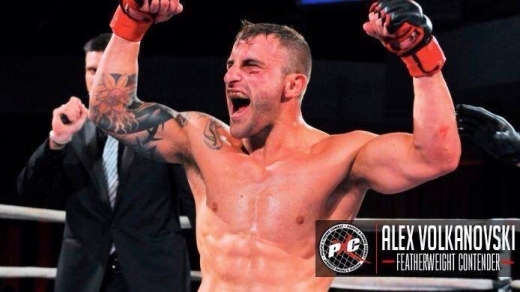 Alex Volkanovski is considered one the best mixed martial arts fighters in Australia and he's determined to make his mark on the world stage. The New South Welshman's fighting profile is growing in his home country, but the man known as 'The hulk' is already an established identity in Macedonia - the country of his father's birth. "I've been on magazines in Macedonia and all things like that," he told SBS. "One of my biggest fan bases is probably Macedonians, they always get behind me. "They’re always hitting me up on Facebook speaking Macedonian to me which I don't understand, so I get my dad to translate it for me." The winner of 13 professional fights will get the opportunity to mix with the world's best when he makes his debut in the Ultimate Fighting Championship (UFC) on November 27 in Melbourne. Millions of people are expected to tune in to watch him take on Japanese fighter Yusuke Kasuya in the Octagon - the steel cage structure used for UFC bouts. Volkanovski's road to the world's premier MMA organisation hasn’t been without its obstacles. He was twice poised to fight in the popular US organisation, but on both occasions his dream was snatched away. Volkanovski regularly trains in Thailand, which has proved challenging for his young family. He married his wife Emma in 2012, and their daughter Ariana will have her first birthday next month. “I would go away and I was meant to do a month of training, and then two or three weeks into it, I would cut it short because I couldn’t stay away that long,” Volkanovski said. “We were living with my Mum and I don’t like to be sponging off people. Australia has never had a UFC champion, but Volkanovski is eager to become the first. “I was never planning on just making the UFC, I was always planning to be champion,” Volkanovski said.